Within criminal justice careers, perhaps no other area or action draws the public scrutiny, and sometimes ire, than a use of force. Law enforcement and corrections officers are necessarily authorized to employ various forms of physical control in order to carry out their jobs. The circumstances, level, and the degree to which that force is used, however, is often the subject of serious debate. Though the idea of law enforcement has a long history, in truth modern policing as we know it is a relatively recent societal institution. The history of the professional police force is less than two centuries old. 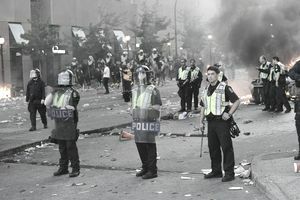 Prior to the establishment of standing law enforcement agencies, there was a great deal of public concern over granting power and authority to what they feared would become another occupying force, and thus there has always been a slight level of mistrust between society at large and those who have been sworn to serve and protect them. Though they have been granted the authority to use force when necessary, the public has long been wary of the abuse of this power. Nevertheless, in a more rough-and-tumble era, more rough-and-tumble tactics were called for. Officers did not have as many force options available to them as they do now, and society did not have the same distaste for harsh justice as it now seems to. As society has advanced and evolved, though, so have public attitudes toward crime and punishment, as well as law enforcement and police tactics. Over time, the public began to demand more mild and measured responses to crime as opposed to brute force. This has been accentuated in recent history with the proliferation of video and photographic technology, first on television and then on the Internet. From Rodney King and Marvin Anderson to Andrew "Don't taze me, bro" Meyer and the latest YouTube police video, law enforcement and corrections officers have been placed on notice that the public is watching what they do and how they do it. The added scrutiny has gone a long way towards keeping officers honest and to expose those who are not. In response to the increased attention, police, correctional officers and other criminology and criminal justice professionals have made advances in policies as well as technology. In addition, courts and criminal justice standards and POST commissions have introduced guidelines to aid officers in making sound decisions on when and how to use force. Despite this evolution in police tactics and technology, a disconnect still exists between what the public sees, expects and understands about law enforcement training, goals and practices and how police and corrections officers are actually trained to respond to use of control situations. Most often, when members of the public question an officer's use of force, they first question whether force was necessary in the first place. Likewise, courts tend to focus first on whether or not any force was justified at all before broaching the topic of excessive force. To look at this question properly, we must first understand the ultimate goal of officers when they apply force. Generally, the purpose is to effect an arrest and bring a potentially dangerous situation to as quick and peaceful a conclusion as possible, without injuring the officer or innocent members of the public. Obviously, the preferred outcome would be for a resisting subject to allow himself to be arrested peacefully. When that doesn't occur, though, officers must make a quick, split-second decision whether or not to employ force and just what force to employ. During that decision-making process, the well-being of the suspect is most often a secondary concern. Because these decisions must be made quickly, officers may not have all of the information regarding the level of threat a subject actually poses before they feel that they must take action. In Graham vs. Connor, the U.S. Supreme Court established the "objective reasonableness standard" to determine whether or not force was justified. Objective reasonableness simply asks whether or not a reasonable person with the similar training, knowledge, and experience would have acted the same under similar circumstances. In making this determination, three factors are applied: whether or not the subject poses an immediate threat, the severity of the alleged crime, and whether or not the subject is attempting to flee or resist arrest attempts. Implicit in the so-called "Graham factors" is the question of whether or not the officer was justified in exercising his arrest authority, to begin with. Most importantly, the objective reasonableness standard recognizes that officers must think fast and act fast. Under these circumstances, the facts available to the officer at the time she made her decision to use force are what the officer is judged by, as opposed to what may come to light after the fact. For example, if an officer shoots a subject who is threatening him and pointing a gun at him, it does not matter if it turns out later that the gun was not loaded. If the officer can articulate that at the time of the incident he believed his life or the life of someone else was in danger, then he will have been justified in his use of deadly force. If an officer learns after the fact that what he perceived to be a weapon was actually a toy gun, a cell phone, or even a wallet, the standard by which the action will be judged will come from what the officer knew at the time. Officers need not, and often times cannot afford to, wait for a subject to pull the trigger or try to stab them before they react. Instead, they must weigh the totality of the circumstances and make a decision based on the facts available to them at the moment. The objective reasonableness standard also establishes that officers are not necessarily limited to the least amount of force possible. Rather, officers are called to use only that force which falls within the range of what might be considered reasonable. This is an important distinction to make because in most situations there is a range of force options available, all of which may be an appropriate response. For example, if a subject is fighting and resisting arrest, an officer may choose to use pepper spray, an electronic control device, or hands-on control techniques such as joint manipulation in order to gain compliance. Anyone of these choices may be reasonable, though the public may perceive the taser or pepper spray to be more invasive and less necessary than going hands on. An officer's actions, then, are not evaluated based on what she could have done differently, but rather they are assessed based on what might be considered reasonable. This standard becomes especially important when looking at instances of deadly force by police officers. By and large, officers are taught at the police academy to meet deadly force with deadly force. They are trained and given the techniques and tactics to make sure they make it home at the end of their shift, and they spend extensive time training in the use of firearms. It's important to recognize that, when discussing the use of deadly force by officers, the expected result of a subject's actions don't have to be death. Instead, deadly force is described as actions that are likely to cause either death or great bodily harm, which could include permanent disfigurement without causing death. The type of weapon used is an important factor in an officer's decision to use deadly force, but it is not the only factor. To a police officer, deadly force is deadly force, whether the subject is wielding a knife, an ax, a gun or a baseball bat. All of these have the potential to take a life or cause great bodily harm. Instead, to be justified in employing deadly force, officers must be able to articulate that the suspect had the apparent ability, opportunity and reasonably perceived intent to commit an act likely to cause death or great bodily harm. Though important to law enforcement and correctional officers, this standard is often the source of confusion on the part of the public when it comes to police use of force. As an example, an officer may shoot a suspect who is holding a knife. Some members of the public may disagree with the officer's decision, suggesting instead that he should have used a non-lethal weapon such as a taser to disarm the subject. While a taser may have been one of many possible options available, it may not have been the most reasonable or, more likely, it may have been one of many reasonable force options and thus, given the fact that a knife is quite capable of causing death or great bodily harm, the officer is very likely justified in the use of deadly force. Another important consideration in evaluating an officer's use of forces is the officer himself as compared to the subject in question. An officer who is 5'2" and 100 pounds may be justified in using greater force against a subject who is 6'2" 250 pounds than would a taller, heavier and presumably stronger officer in similar circumstances. All of this goes to demonstrate that uses of force by corrections and police officers are most often far more complicated than a single news story or Internet video may initially make them appear. Law enforcement careers are known to be inherently dangerous jobs, and officers are often placed in situations where they are required to make instantaneous life and death decisions. While it is entirely correct and appropriate to evaluate and scrutinize the actions of the police, especially when they employ control techniques, it is also very important to withhold judgment until all of the facts leading up to the incident are known. It is especially important to judge these decisions based only on those facts that were known or perceived by the officer at the time of the incident, as opposed to those facts that may become known after the fact. Likewise, it is important for officers to use sound judgment and due diligence when determining whether or not to employ force and exactly what force to use. The public rightly holds its law enforcement officers to a high ethical standard. It is incumbent upon officers, then, to adhere to that standard and to always act in the interest of safeguarding lives and property, while at the same time preserving and protecting the rights of the innocent.